Medical and nutrition experts unanimously proclaim the importance of consuming multiple servings of fruits and vegetables each day, but finding the time to prepare and eat five to nine daily servings can be a daunting task. 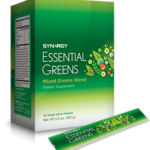 Synergy’s Essential Greens helps you bridge this gap through densely nutritious green vegetables. This product harnesses the powerful process of photosynthesis, which takes sunlight and transforms it into energy that fuels the world. This energy is called chlorophyll. 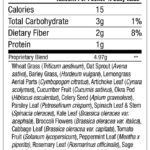 Chlorophyll helps protect healthy cells, supports immunity, and acts as a natural deodorizer. 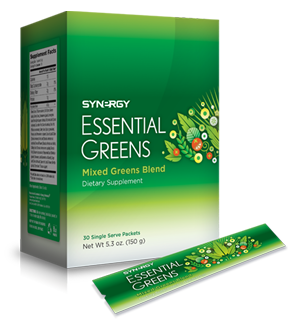 By concentrating chlorophyll and other photosynthetic elements into an easily digestible powder, Synergy has created a product that offers complete green nutrition. Mix one serving (one scoop) in one liter of water. Mix briskly. Take daily. *As with any nutritional product, please consult your physician before use, especially if pregnant, lactating, or have a known medical condition. These statements have not been evaluated by the Food and Drug Administration. This product is not intended to diagnose, treat, or prevent any disease.